Put your hands together for our newest Vegan Bloggers Unite! member – Willow Moon. Willow is the author of Create Mindfully. I enjoy the variety she blogs about from vegan recipes (sometimes gluten free too! ), to DIY projects, and thoughts on the vegan lifestyle as a whole. Follow Willow on her blog, Facebook, Twitter, Pinterest and Google+. Welcome Willow! Have you ever gone to a Thai restaurant and ordered their delicious spring roll appetizers with peanut or sweet chili dipping sauce? They are one of my favorites things to start a meal with. The spring rolls you get at a restaurant usually have carrots, cabbage, tofu (if you’re lucky) and transparent rice noodles. The transparent rice noodles are made from starch, and so is the rice wrapper. With the rice wrapper and the rice noodles, that’s a lot of carbs! If they come with the sweet chili sauce, and you like a lot of sauce, like me, that’s a bunch of sugar! Even though I love them, I don’t love the carbs and the sugar. When I’m at home I will eat the spring rolls as a meal, but I like to change it up, adding more protein and less carbs. I use brown rice spring roll wrappers instead of white. 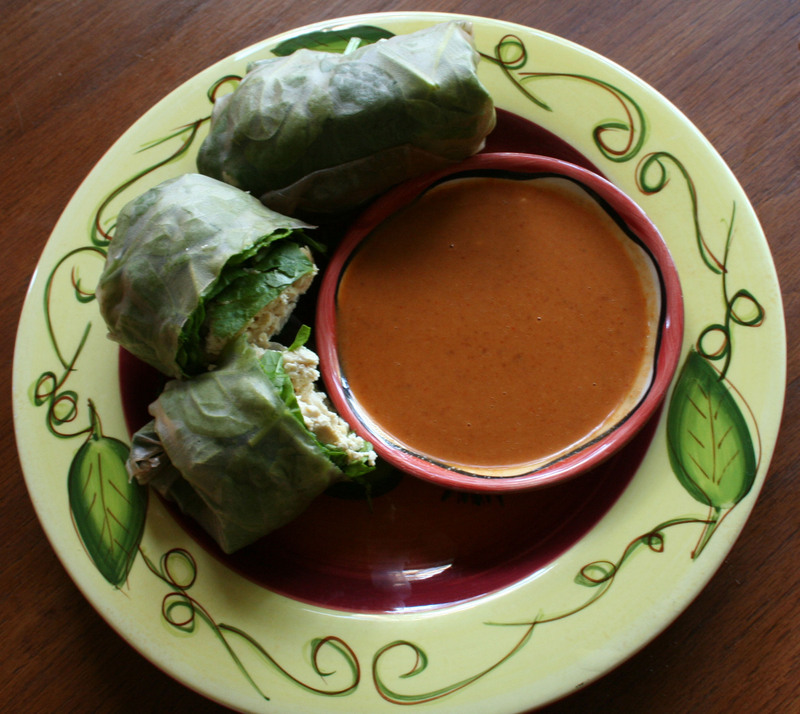 Here is my healthier version of Thai restaurant spring rolls. You may want to double this if you like a lot of sauce like me! Mix all ingredients with a whisk or fork until blended. Remove water from tofu and slice into squares. I like to turn the tofu so that it is standing up, then I slice it into thirds. Then I lay it flat and slice into fourths. This way you have 12 tofu squares, which is easier to flip on the frying pan. Spray frying pan with coconut spray oil and fry tofu until golden brown. Set aside. Heat 2 cups of water in microwave. 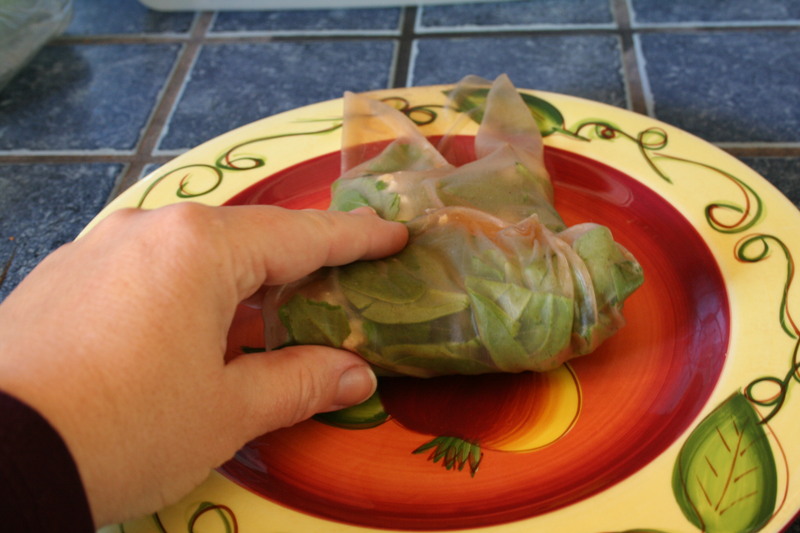 After water is heated, put the water in a large enough container to hold the brown rice paper wraps. 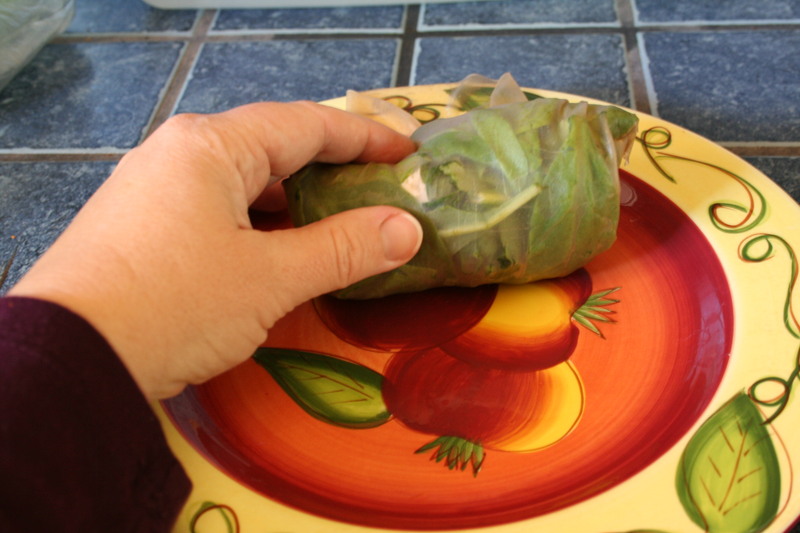 Dip one of the wraps in the water, turning until it is pliable. 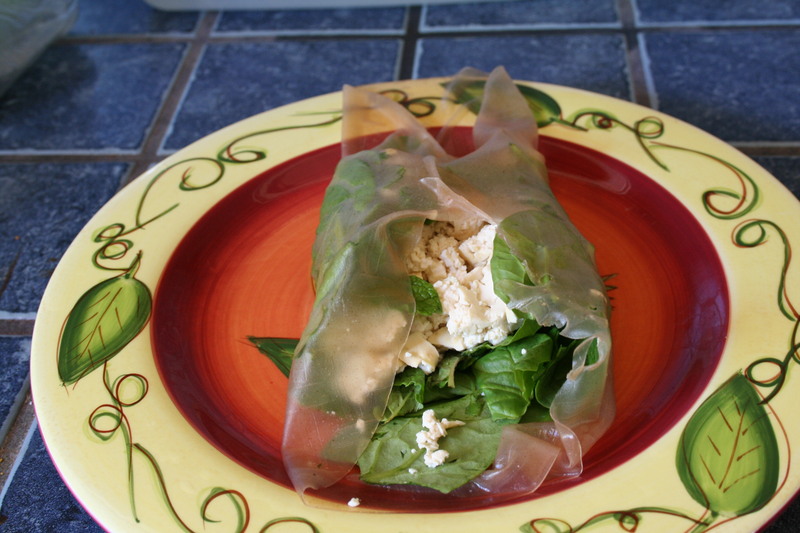 Put the wrap flat on a plate and fill with ¼ each of the above amounts of the cilantro, mint, spinach, and tofu. Roll like you would a burrito. Here’s a recipe that will knock the eye teeth out of any guest. Prepare yourself for Angela from Canned Time‘s recipe for Orange-Pear Cheesecake with Biscoff Drizzle. Yes, it’s refined sugar free too, amazing. Angela has many links to connect with you – so please do check them out: Blog, Facebook, Pintrest, and Twitter. Please welcome Angela! I think that I could eat Cat food if it has Biscoff drizzled on top of it….so…. Okay everyone…this one is a keeper! I received some fancy pears for Christmas and I have tons of oranges left over from Holiday munching still and so I decided to blend them all up together with some Tofutti and see what would happen. Soak 2 cups of Cashews overnight, drain and rinse. onto the bottom of a medium size spring form pan to about 1/3 inch thick. Place in the freezer. Juice of 2 medium size Oranges, include the pulp. Combine the filling ingredients into a food processor and blend until very smooth. Pour the filling onto the frozen crust and smooth out the top. Cover with foil and chill or freeze until the top surface is hard. Remove the sides of the spring form pan. Drizzle warmed Biscoff spread over top of cake and refreeze or serve immediately. Optional additions to the filling: 1 tsp. of fresh ginger, 2-5 crushed Biscoff Cookies, 1 tsp. Orange Zest or Liquid Orange flavored Stevia. Also, I kept my version ‘raw’ but it would bake up nicely if desired. 350 for 45 minutes in a water bath. Keep the cake chilled though even if baked. And the Biscoff drizzle? Well if you don’t like anything else about the cake, you’re sure to at least scrape that off with your spoon and you’ll be happy still. Somehow I think you like the rest of the creamy fruity taste as well, but I’m just sayin’….Biscoff and fruit and creamy cheesecake? Heaven! And remember: One man’s bruise is another man’s flavor………..
Jackie is most likely in transit between moving from Canada to the US and during her time in Canada she has been very kind to provide a few posts to VBU! Feel free to read her previous posts: Wheat, and soy ….oh my!, Change your diet, skip surgery and I’m a shareholder…in Community Shared Agriculture. Stay in touch with Jackie through her Facebook, Twitter and blog. Welcome back Jackie! A friend of mine told about some jalapeño poppers she made recently and I instantly had an uncontrollable urge for these spicy and creamy bites (thank you for the inspiration!) I picked up the ingredients the next day and set out to make a healthy plant-based version of a usually greasy and fattening version. I was thrilled with the results. They were spicy, crunchy, creamy, melt-in-your mouth peppery goodness. I ate so many I spoiled my dinner, but it was worth it. Top with more hot sauce if you want them even spicier. Then try not to burn your tongue. Welcome to the Virtual Vegan Potluck 2012! Welcome! Please, make yourself comfortable, you’re in for a treat. Thanks to Annie of An Un Refined Vegan, you’re about to start on a wonderful path of different vegan blogs showcasing recipes for every course in a lavish meal. If you’d like to join the conversation, we’re using the hashtag #virtualvegpotluck . This post is courtesy of Vegan Version. You can read about Lee’s Blog here. Hope you enjoy this vegan delight! Growing up in a Middle Eastern family I was exposed to many great foods at a very young age. My Father is from Beirut, Lebanon and my Mother learned to cook authentic Middle Eastern food from my Grandmother and Aunts. And, I was lucky enough to have my Mother teach me. 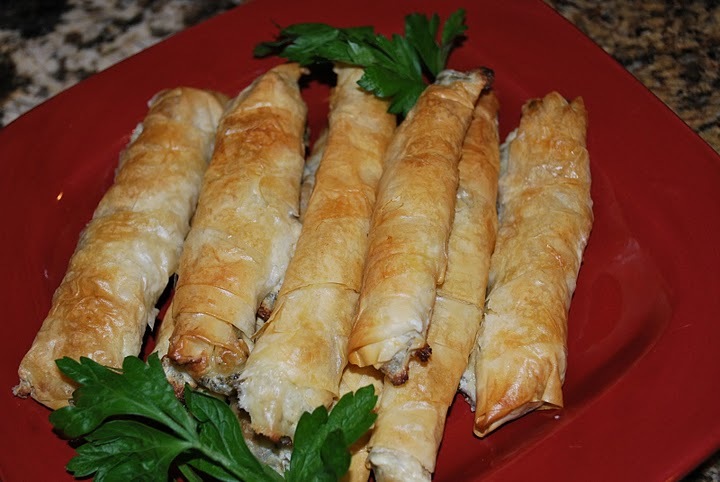 Borek was something we often had at family gatherings. I would snack on them all day long – to the point that I was not usually hungry when dinner was served. They can be made in many variations; the ones we had were usually cheese filled. They are such a wonderful treat and I have not had one since going vegan. I decided that there must be a way to replicate these wonderful snacks so I set out to concoct a recipe of my own. Tasting these brought me straight back to my childhood. They taste great, a crispy, flaky outside and creamy, cheesy inside. As far as I remember, they are very close to the original. Many people are intimidated by phyllo dough- don’t be. Even though it is delicate it is actually pretty forgiving to work with. And the end result is always so pretty! Mix the cream cheese, Daiya, parsley, salt and pepper in a bowl. Stir until well incorporated. Set aside. Mix the olive oil and non dairy milk together and whisk to incorporate. Take the phyllo sheets, still stacked and cut them in half. Then cut each half diagonally to create two even sized triangles. Take one phyllo triangle and lay it on a flat surface with the short side closest to you. Place a tablespoon of the cheese mixture toward the bottom of the short side of the triangle and spread until it almost reaches the outside corners. Fold the corners in around the filling and roll the sheet until it creates a cigar shape. Seal the tip of the cigar with a little bit of water. Place on a lightly greased baking sheet. Brush liberally with the olive oil and non dairy milk mixture. Repeat until all triangles of phyllo are used. Bake at 430 degrees for about 15 minutes or until the phyllo is golden brown. *Note: when working with phyllo be sure to keep the sheets you are not working with covered with a damp towel so it does not dry out.